An electric blanket is made of electrical cords that stay close to your body when you sleep. - Exposure to low-frequency magnetic field: The magnetic field of an electric blanket is 3.5 micro-Tesla, about 10 times higher than a carcinogenic (cancer-causing) amount. Another way to warm your bed, the hot water bottle, needs time to heat the water and only warms a small area of the bed. And it doesn't last all night. What happens when the bottle becomes cold? 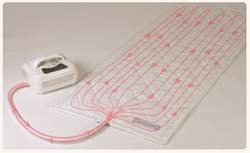 CLIMSOM is a heating mattress topper with an electric system away from the bed. You sleep on a network of tiny pipes that circulate hot water. Thanks to CLIMSOM, you can choose the most comfortable temperature for your bed to the exact degree throughout the entire night. For the first time, we have an innovative product that warms the exact surface on which you're sleeping. SECURE: No contact with cords, no magnetic field near the body. COMFORTABLE: Gentle, adjustable heat to the exact degree (up to 48°C). With the small network of heated water that runs into the mattress pad, the heat is more powerful, relaxing, and enjoyable than a simple warming blanket. REVERSIBILE: As summer approaches, you'll be happy to discover CLIMSOM's cooling function, which provides localized “air conditioning” in your own bed, and you can personalize it just like you would the heating function. ECONOMIC: CLIMSOM consumes 6-8 times less energy than heating or air conditioning. CLIMSOM is an alternative to traditional warming blankets and provides even more comfort, security, and accuracy at your desired temperature. It's a better solution for managing your sleep environment. Your nights with CLIMSOM will change for the better. If they don't, just return CLIMSOM to us within 30 days, and we'll refund your money in full.